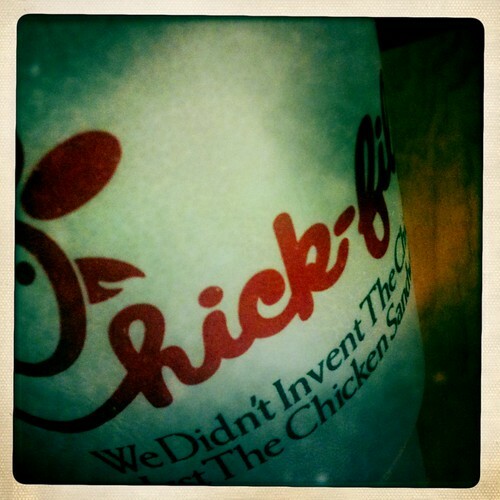 The Chick-fil-A controversy has been confounding from the outset. Who eats at that chain and doesn’t know about its founder Truett Cathy’s conservatism? Has nobody walked there on a Sunday and seen the message from Cathy, explaining that the restaurant is closed because the company honors the Sabbath? Did nobody notice how Cathy got an honorary degree from Liberty University the same day that Mitt Romney did? You’ve heard of the Spork, but how’s about the Chork? I’ve been to Chick-fil-A 110 times in the last 12 months. When Chelsea and moved back to the South last year we arrived in Jasper, Alabama on December 17. From December 17, 2010 to December 17, 2011 I consumed Chick-fil-A 110 times. I know this because I’ve used Foursquare to track my activities for the last 2+ years. I love Foursquare because at the heart of my discombobulated life and ADHD-ish attention span, I am a number geek and map geek. I like to track my activities, and Foursqaure does a good job of that, despite the occasional this. Foursquare doesn’t yet provide what I would term “substantial analytics” tools to help me break down my activity into something more meaningful like the number of locations visited, the most frequented locations, or breakfast vs. lunch vs. dinner vs. snack binging… but 110 is n indicator nonetheless. Why the obsession? I wouldn’t call it so much an obsession and I would call it the lack of food and service quality across the board at other fast food chains and restaurants, and how Chick-fil-A has them beat by light years. I love the products Chick-fil-A makes, and how each one (aside from the coffee) is pretty much near perfect. I love the way they treat their employees, and how that translates into how their employees treat me. I love how fast and easy it is to buy something from Chick-fil-A. But at the end of the day Chick-fil-A is simply a great place to eat and always a pleasant, enjoyable experience. Before I moved to Seattle in August 2006 I faced the stark reality that the business I love the mostest was nowhere near Seattle. By “nowhere near” I mean 763 miles. When one opened about 2 hours north in the Western Washington University student union, I ensured that a weekend trip revolve around food… but the Chick-fil-A was closed the first time… but open the second… and the third, etc. I spent many days trolling them on Twitter to open a Seattle location, and sometimes they responded. They’ve yet to expand in to Seattle, but I hope they do because every time we drove north to Western Washington University we would always bump into other Seattleites equipped with coolers and dry ice, prepared to haul back weeks of sandwiches to quell their cravings. I’m not joking. That type of behavior makes my 110 visits pale in comparison. By the time you read this, I, like many of you, will have devoured Chick-fil-A’s latest piece of awesomeness: the spicy chicken biscuit. How to survive in a post-Trader Joe’s world? Trader Joe’s is my new Chick-fil-A. One is America’s premier non-drive thru, the other is America’s premier market. Affordable, delicious groceries and wine… ugh, I’m gonna miss you. Chelsea looked at me during the SEC Championship Game and said, “We’re driving to Atlanta once a month to go to Trader Joe’s.” I’d argue with her if I didn’t agree. Once-per-month trips to Trader Joe’s? Might as well swing by H&M on the way. It will be strapped into my passenger seat belt during the drive to Alabama. If you have a Twitter account, and we follow one another, you’ve seen me complain attempt to speak to Chick-fil-A about their lack of a mall unit or FSU (free standing unit) in the Seattle metropolitan area. No… the Chick-fil-A Express two hours away in Bellingham does not count. I always thought Chick-fil-A saw my tweets; now, I know they see them. See the timeline (complete with Ernest participation!) below. I had a measly three days in the South. Our hotel was 5 miles from the nearest Chick-fil-A, and with a rental car at my side I did the most damage possible. It was my first time trying the Spicy Chicken Sandwich, and I actually liked it despite my “If it ain’t broke, don’t fix it” mentality. I actually found it quite spicy… but I’m a pansy after all. By the way, I haven’t done the calorie count on the aforementioned items. I’d prefer not too, but you feel free. Yes, Chick-fil-A and it’s minimalist menu have slowly but surely expanded over the years. I don’t know if the Spicy Chicken Sandwich is jumping the shark per se, but it’s definitely akin to Chick creating and “eXtremE! !” version of their perfect, Utopian chicken sandwich. Get one for free next Friday. We hit a team goal last night, so my boss took us to Seattle to celebrate with one of the most high-felutant dinners, ever: Raw Oysters, Escargot, Foie Gras, Tarte FlambÃ©, Salmon Coulibiac, Mini Croissant au Jambon, Moules MariniÃ¨re, Belgium Fries, Goat Cheese and Garlic Mousse, FromagÃ¨re, and FermiÃ©re. Ok, Jasper folks. Tell me about this restaurant. God knows that any business with down home cooking and an uneccesary misspelled name has great potential. Walker County ranks as stateâ€™s third unhealthiest in national report. Kinda makes me proud. Viva la Victoria’s! Papa Murphy’s had a Valentine’s Day pizza, and the clichÃ© nature of it all was too hard to pass up. Once the pizza came out of the oven, the cheese had melted and it looked like Chelsea gave me an oval pizza for dinner. The Hard Rock Cafe! Seattle! Photos! Brand new! Looks like any other Hard Rock, only with a better beer selection. Question: What is the one food item you cannot live without? Coworker of mine goes fishing at Alki Beach and catches these suckers right-n-left. Far be it from me to turn down the opportunity to learn how to make fried calamari. Side note: These pics are from my iPhone 3Gs. Not too far in the future, our mobile devices will be on-par with our $800 cameras. The problem: Chemicals, including perfluorooctanoic acid (PFOA), in the lining of the bag, are part of a class of compounds that may be linked to infertility in humans, according to a recent study from UCLA. In animal testing, the chemicals cause liver, testicular, and pancreatic cancer. 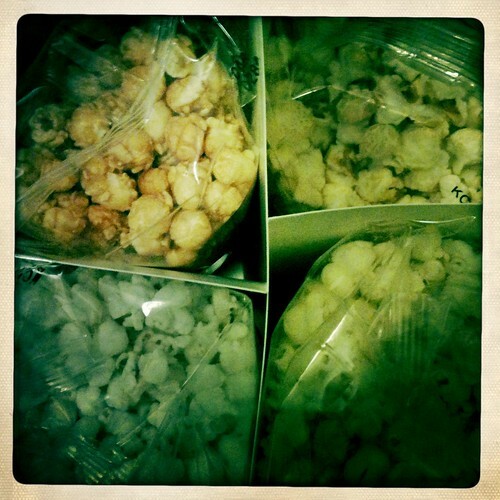 Studies show that microwaving causes the chemicals to vaporizeâ€”and migrate into your popcorn. “They stay in your body for years and accumulate there,” says Naidenko, which is why researchers worry that levels in humans could approach the amounts causing cancers in laboratory animals. DuPont and other manufacturers have promised to phase out PFOA by 2015 under a voluntary EPA plan, but millions of bags of popcorn will be sold between now and then. The solution: Pop natural kernels the old-fashioned way: in a skillet. For flavorings, you can add real butter or dried seasonings, such as dillweed, vegetable flakes, or soup mix.